April 21st – The People in darkness have seen a great light! The People in darkness have seen a great light! On Holy Thursday at the Passover Meal Jesus offered himself to us as The Bread and Cup of Life. He took the place of the slave, bent low and washed our feet and asked us to do they same to and with each other. We are to love and serve each other as he as shown us. On Good Friday, we stood with the crowd and watched as Jesus was betrayed, denied, beaten condemned and crucified. With Mary his mother, we saw him being buried. But we know that this is not the end of the story; our God is a God of surprises. Today, this Easter morning Jesus is risen and is alive in a way that is more powerful than ever before! Having travelled with Jesus through Lent and stood by him as he endured his passion, we now stand at the empty tomb and share in the power, glory, joy and new life of his resurrection. 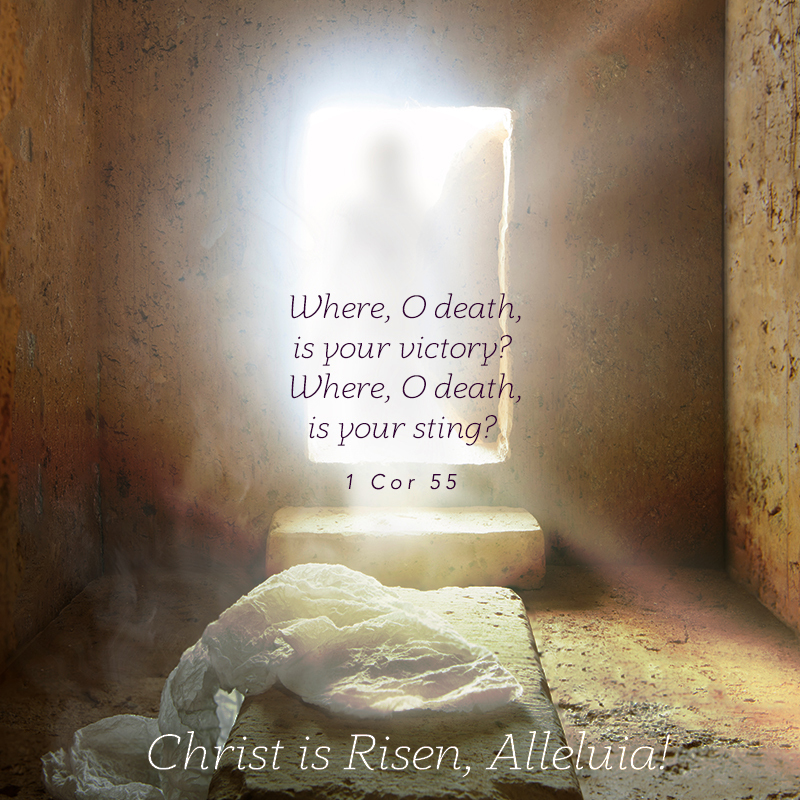 We are an Easter People and Alleluia is our song! Our ways are not God’s ways and God’s thoughts are not our thoughts! Where we saw failure and evil triumph, God saw the faithfulness of Jesus and the values of the Kingdom reign supreme. Through the Life, Death and Resurrection of Jesus, God has shown and offered us a new way of living and confronting evil. We don’t have to respond to violence with more violence; we don’t have to answer hatred with more anger; there is another way: The Way of the Cross that leads to Resurrection. This is the way of the Gospel and the Kingdom of God. This Easter Season, which lasts until Pentecost Sunday, we are called not only to experience the Good News of the Resurrection, but we are also called to be people of the Good News in our ordinary lives. WE ARE AN EASTER PEOPLE AND ALLELUIA IS OUR SONG! The two were running together, but the other disciple outran Peter and reached the tomb first. He bent down to look in and saw the linen wrappings lying there, but he did not go in. Then Simon Peter came, following him, and went into the tomb. He saw the linen wrappings lying there, and the cloth that had been on Jesus’ head, not lying with the linen wrappings but rolled up in a place by itself. Then the other disciple, who reached the tomb first, also went in, and he saw and believed; for as yet they did not understand the scripture, that he must rise from the dead. Then the disciples returned to their homes.